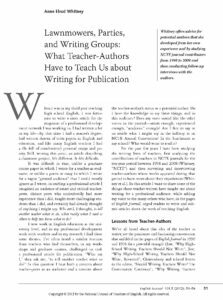 In light of what I’ve learned from these teacher-authors, I now think back to my first try at professional writing and find that two critical differences stand out between this writing and the other writing I had done in the past. The first difference was how good it felt to write about what I was doing in my classes at all. Usually, my classroom life felt rushed, ideas and half-considered problems speeding by at an exhausting pace, coupled with a feeling of never really doing anything quite thoroughly enough. But when I worked on the article, somehow time would stop, and I had a sensation of ample time to think about and understand the short classroom episode I was trying to describe. How different it felt to reflect in this way, compared to the rushed pace of everything else in school! Given the pace of teaching English in a public school, I found it extremely difficult to find the time to work on my article at all, but when I did find it, working on the article created a luxuriously contemplative space in my head to think about teaching. And my job didn’t have many such spaces.